If you insist on using a mouse and keyboard with your iPad (or, less likely, your iPhone) you’ve probably heard of BTStack Mouse and BTStack Keyboard. Reaching for a touch screen while typing can be awkward, so mouse support is a huge advantage. The problem with the custom BTStack drivers is that they don’t work in tandem with Apple’s default bluetooth drivers – you have to switch between one and the other. This means you can’t take advantage of wireless headphones or bluetooth tethering while using a wireless mouse and keyboard. 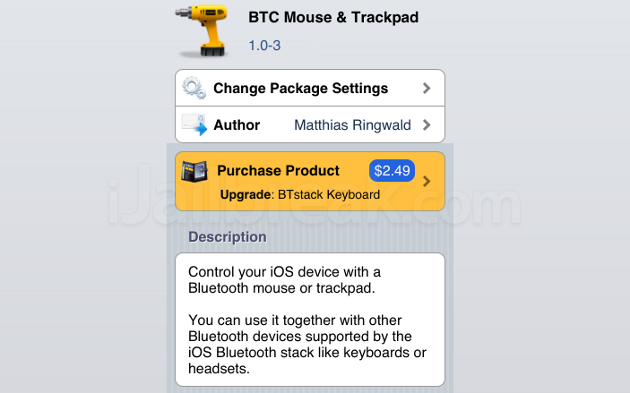 Matthias Ringwald, the developer behind the iOS BTStack Mouse and BTStack plugins has released a new tweak on Cydia called BTC Mouse & Trackpad. BTC Mouse & Trackpad takes advantage of another recent utility that Ringwald developed: Bluetooth Companion. Instead of making a new bluetooth stack, Bluetooth Companion allows plugins to extend iOS’ native bluetooth implementation. That means you can connect to the internet, use a mouse and keyboard, and listen to music at the same time through your bluetooth connection. 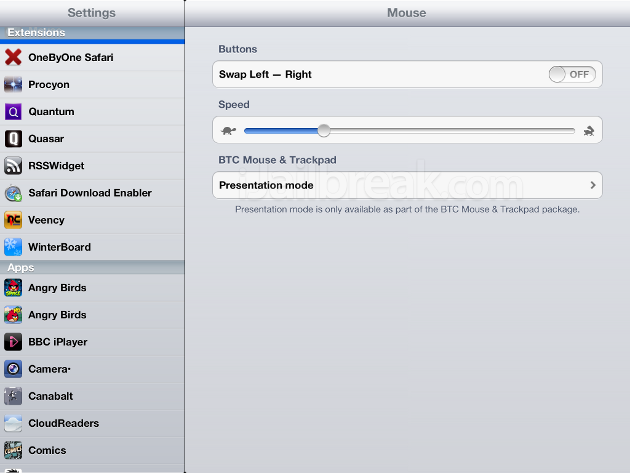 BTC Mouse & Trackpad‘s Presentation Mode simulates back and forward finger swipes in designated apps. The BTC Mouse & Trackpad plugin costs $4.99, though if you already shelled out for BTStack Keyboard the price drops to $2.49. Depending on your bluetooth needs, it might not be worth the upgrade, but if you’re deciding between the two, go with BTC Mouse & Keyboard. The plugin can be found in the BigBoss repository on Cydia. Do you need to upgrade to BTC Mouse & Trackpad, are the old BTStack tweaks good enough for you, or are you one of the rebels with a Camera Connection Kit and a USB mouse? Share your thoughts in the comments section below. I bought BTC Mouse & Trackpad 1.4.2-3 but I can’t pair my Apple Magic Trackpad in iPhone 5 iOS 6.1.2 and I can’t understand why ?!? Maybe not compatible with others tweak but I don’t know witch one. Do you know something about that !? I had the same problem, but installed Bluetooth Companion and you should be able to pair just fine. It seems to work OK with 32-bit devices on iOS7 but not the newer 64-bit ones. As stated the developer is working on a fix for early Feb. Hopefully soon :) Still can’t figure out why Apple doesn’t just build this in. does this (also) work on wired mouse using an OTG support? hello im from chn ios10.3.3 still can’t use When will it update?